This shark toilet is so grotesque that I feel obligated to balance the horror with a little spirituality. If you’re obsessed with sharks like I am, you might have wondered why they manifest in your dreams, plague your waking thoughts and perhaps even haunt your toilet. Check out this fascinating discussion about shark symbolism. It may inspire you to start a new religion. 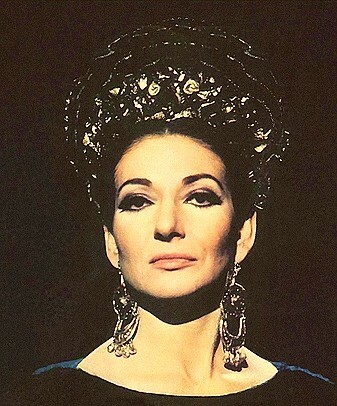 On the threshold of a new obsession, I ask: how much do I want to know of Maria Callas? Did she really throw a shoe at someone? Was she better fat or thin? What was the texture of her exile? How much of the transcendence I feel is because I do not understand the words she sings and how much is just the sheer miracle of her voice? My brother Sean reminds me of the poet Frank O’Hara who, as Allen Ginsberg once said, “loved everything.” O’Hara understood that a poet could not afford to fall out of love with poetry. Frank O’Hara loved movie gossip and he loved painting and he loved the ballet. Sean loves punk rock and film noir he loves baseball and he loves ballet and he loves Maria Callas. Once Sean took me to the Boston Ballet. As beautiful as it was, I felt alienated. It’s a story of gesture, I told myself, of yearning, of emotion. Get out of your head. While Sean swooned and even cheered his favorite dancers, while he transcribed his rapture in a worn pocket notebook, I fell asleep. When I woke up and there was a huge ship onstage. The ship seemed to cleave straight through my gauzy dream shreds, and the elegant, muscular and utterly alien narrative that had unfolded on that stage. Admire ballet? Marvel at it? Yes, but “get” it, even on a visceral level, no. Around that same time, Sean gave me “Master Class” by Maria Callas. I don’t know Puccini from Verdi. I don’t know Italian. Sure, if the opera is “Macbeth” or “Medea,” I have a bit of a frame for the foreign sounds, but otherwise I have no clue what’s being mourned or exalted. But it doesn’t matter. When Maria Callas sings, I am enthralled. I want to live inside the story of her voice, a place both cavernous and intimate. Maybe it’s the draw of the unfamiliar. Her voice reminds me of unexplored Aegean, all the places I never got to see on my all-too brief tour of Greece. Her face is the drama of landscape, the stark, savage, beautiful and frightening. Remember always feel the words you are saying. You must do it a little cleaner. No. The “R” must not be heard. I know it’s difficult on the breath, but it must not be heard, eh? All my main gods are men. John Lennon, James Joyce, Bob Dylan. I have a few goddesses: Virginia Woolf. Marilyn Monroe. What does a goddess give one that a god does not? I don’t know. But when I see scenes from Pasolini’s film adaptation of Medea, I want to scale the stark Anatolian hill and follow Maria Callas inside that severe temple. My old writing teacher John Rechy used to keep pictures of his goddesses on the wall: Garbo and Marilyn. “She was a creation!” John used to cry when trying to articulate the majesty of Marilyn. I loved that description. A creation! Equal parts self-invention and natural force. John’s students met at a dining room table underneath these glamorous triptychs—two Garbos and a Monroe, if I’m not mistaken. While we worship the cheekbones and shadows and fierce eyebrows, we often forget that creation is a process. “Master Class” reminds us of how instructive, how valuable it is to see how a song, a phrase, a voice is made. 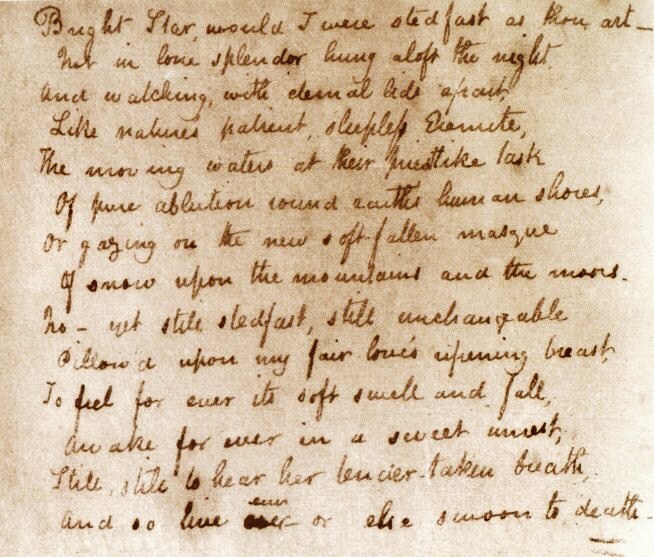 Once I stepped out of a New York blizzard into the sanctuary of a quiet library to see the original manuscript of “The Wasteland” and I remember thawing out under the yellow light and looking at the marked up pages, Eliot’s naive and simple stanzas nearly obliterated by Pound’s insights, his demands. I remember the delight of driving from Boston to New York with a fellow Beatles freak who found listening to twelve consecutive versions of “No Reply” to be not only a delight, but a serious education in phrase and harmony and desperate joy. We each have our own masters inside already– echoes and layers—all that we’ve read and heard and loved and memorized. 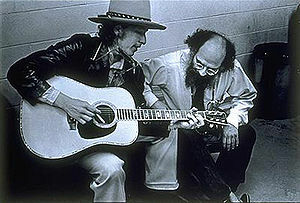 We don’t need to dissect their legends, but to draw on the deep pool of their mystery, of genius. We need those teachers, those great loves to become strangers to us again and again, their eternity fresh, and powerful and sharp, their names forgotten, unknown. The poet John Donne said “No man is an island. If separated, do two objects ever long for one another? Does the owl cookie jar miss the hollow witch with her plastic apple and pipe cleaner worm? Why do I still mourn for those unwanted thrift store clothes, so eager and ugly that wait slump-shouldered on the rack? I wonder if animals in the spirit world ever muse on the fates of their bodies. Does the cow ponder his skull and think: “Better my head be used as a ceremonial mask to conjure dreams than being painted turquoise and bolted to a steak house wall where it inhale through the stone canyons of its nostrils, the memory scent of its own burning flesh.”Does the turtle find wonder in the shell reborn as ceremonial rattle? Is initiation into “the sacred” preferable to being sold as an overpriced bohemian “curio”? in those meadows where they move like happy shad ows? I’ve been listening to the same song for three days. No news. No movies. Nothing. Just one song. In my car. In my apartment. I want to see what lies beyond the fog of the too familiar, beyond the edge of boredom. Can a song heard so many times become new again? Will the ending sound less wistful when I know it’s going to start again for the fortieth time? The song is “Save it For Later” by the English Beat. In the 80s, I kept a radio vigil for it, along with “Talk of the Town,” by The Pretenders. I saw the English Beat perform it at “New Wave Day” at the US Festival in 1982, the same day I saw the Clash and A Flock of Seagulls. It had been a long hot day of rock in San Bernadino, but when the English Beat came out, all skinny and New Wave, I felt reborn. The song is fast. The unfolding spell of memory is slow. It’s the summer of 1983 and I’m in the country, at my father’s house waiting for a letter. I can feel the cold grass under my feet. When I hear a car on the road I shade my eyes with a biography of Keith Moon and look out toward the mailbox. The song won’t give me any more than that. Just a loop. Sun and cold grass. Keith Moon. Waiting. I’ve heard it 100 times and there are still lines I cannot decipher: “My seven seas are rotten through? The seven seas I’m walking through?” But I’m afraid to look up the words. If I know the muddled parts, maybe I’ll lose the grass and sun and whatever feeling rushed through me years ago when I waited for the song, for the letter to set me free. When my father drank too much, he played songs over and over. As a child, I once played “Yellow Submarine” about 35 times at his request. But my father shattered this record one summer when he played “Against the Wind” by Bob Seger fifty times in a row. In the line “deadlines and commitments, what to leave in, what to leave out,” Bob Seger had effortlessly channeled my father’s daily struggle at the typewriter banging out stories about ax murderers and Boston politicians, about defrocked priests and lady blacksmiths. Combined with the potent melancholy of “drifters days” and “seeking shelter” “Against the Wind” conjured a spell against which my father was powerless. I could do nothing but sit with him at the bar he’d created off the kitchen, under the genuine wagon wheel lights, and dime store dream catchers drinking cold well water and listening to “Against the Wind,” until some of my cynicism melted. Upstairs, I slid into a creaky bed in a room cluttered with newspapers all of which contained my father’s stories. I guess I lost my way, oh so many roads…. Each time I came home, I cut some of the stories out of those papers. That night, I couldn’t sleep. I couldn’t dream. I couldn’t find the crooked scissors I usually used to excise his words from the dry bulk of the Boston Herald. I heard the shuffling of slippers downstairs. I could hear my father cough and open the cupboards rooting around for crackers. I listened and somewhere in that slim fragment of darkness, waiting for the song to begin again, I felt the interminable open out into something vast and tender. I’m 17. “Save it For Later” comes on at the Halloween party where I am dressed as a slutty vampire, my hair electrified with Dippity-Do. The guy I’m with is 24. He’s embarrassed to be at a high school party. I sit on the edge of the chair where he’s sitting. Cold saliva pools around my fake fangs. I rest my hand on his shoulder, in silent rapture. When the song is over, we’ll go into my friend’s room, but not a moment before. I want to hold his hand. To see if he notices. To see if I can finally match song with world. Some truths we think we know. Then we actually live them. For me, one such truth is: “All places exist in the body.” I first fell in love with this concept in 1995 at U.C. Berkeley when a poetry teacher of mine mentioned it. In the class, I wrote a short piece about a guy I’d been absolutely nuts about when I was very young—this poem was economical, but full of dreamy sensuality and ribs rising, and concluded with a kind of hazy philosophizing that nothing was really lost if “all things exist in the body.” I changed “places” to “things” thinking there was really no difference. But I didn’t know then that remembering with the body means more than a breathless nostalgic lust, or the addled mind throwing the mostly forgotten body a bone. All places exist in the body. The distinction matters. When my father died, leaving the house I had known and loved and returned to for 44 years to his mentally unbalanced wife, I became an exile. We’re all exiles. We were born exiles, after all. But we live here a while and we forget. Then someone dies or the door forever closes on some beloved place. I learned that losing a place does not feel the same as losing a person. And while I know better than to apply linear timelines to grief, when the initial shock and frequent, exhausting crying jags over my father subsided, the house, the fields, the woods moved in. They took residence in my body in a way that memories of the dead never have. The opposite of an exorcism, a new settling began. I now understood that properly remembered, a well was also a throat, that doors were breasts, that the lifting of old latches, the bark of disappeared trees, all the obscure pleasures of warm mud and cold stone had to have some place to go. But not to become projections–the ever-thinning, forever looping films of the mind. These things had to go where they could grow, a place where all the restless spirits of habit could find their place. A moon-bright field raises hairs on the arms. Wrists go numb remembering dark brooks. as if to say: there was always only here. Is this wholeness at last? The poem ends, but the house still shows up. What does it want of me? There is no danger of forgetting. On the cellar walls, long ago strangers recorded snowfalls in soft pencil, along with recipes for elderberry wine. We added to these our own statistics of startling snowfalls, how much fell, how little stayed. In the barn, the births and deaths of horses are written in blue on the inside door of a hay strewn cupboard. I don’t know what this means. Carried in the body, it no longer even feels like a memory, just a code that if finally broken, might save someone else. I met Carmen Einfinger in New York in the summer of 1996. Carmen is a wild painter, a genius of color. That summer I spent many afternoons in the small East Village apartment Carmen shared with her filmmaker boyfriend while Carmen painted my portrait. In the end, I became yellow, red, green and orange and very tall. In short, we had a blast. 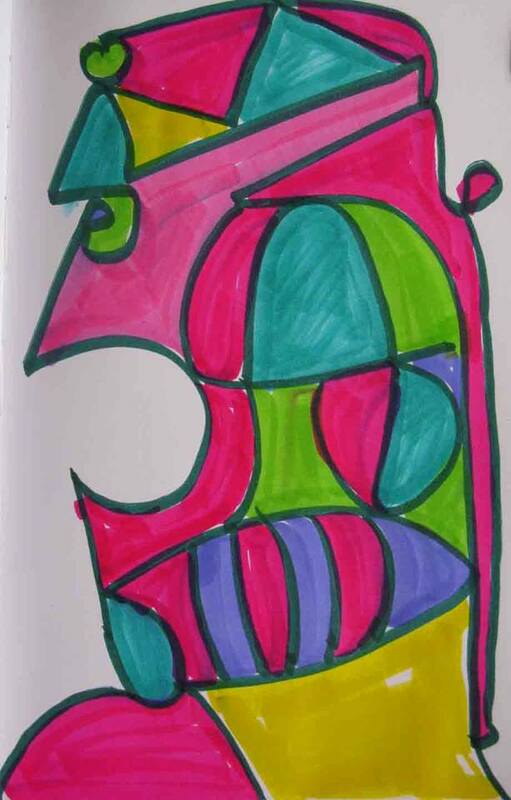 These images I do in my daily sketchbook come from a place of “this child” in me. When I was young, my father was gone. My mother was not around. I was a child, but not this child. This child now creates images from that lost place. However, as much as these drawings are an expression of my lost child, they also are an expression of a lifetime of cultural and artistic development. I believe that we have our own personal and a collective history. We keep imprints in our bodies from all our existences. In the collective unconscious, these emotions express themselves as universal symbols creating then the universality of human emotions. My image “The Man Who Loved Looking at Sharks and then Became One….” is a symbol for what we fear, expressed through the child in its purest primal unconscious state. The man who loves looking at sharks is aware of the danger: the shark could eat him up emotionally or physically. In order to avoid this, he must become a shark, so that he can eat the shark instead of being eaten. The child here speaks of the darker side of the shark, the one he fears. If we are lucky and are able to live our lives without becoming fragmented, we can connect with this primal existence as many times as we wish. I discovered this through my creativity. In this humble blog, one of my recurring questions has been how not to shut down in the face of suffering–both my own internal sadness and the suffering of animals, of aging parents, etc. Today I discovered this terrific and invigorating podcast that grapples with all of these things–a 1996 Ram Dass lecture called Living the Mystery which I highly recommend. (NOTE: Skip the introductory part. Ram Dass is funny and dynamic. Listening to this narrator is like hearing someone describe a movie in exhaustive detail and thereby sucking all the energy & surprise out it. START listening at 17:59! Poetry is a brutal art. One (meaning me) slaves for hours and hours trying to finish a poem that is nearly there. What am I not doing? Am I thinking too much? Pursuing instead of waiting? Filling up instead of emptying out? Oh the pressure of the final stanza! Oh the need for transformation, the weighty promise of the unwritten. I wanted some sharp outline of the knowable unknowable. I wanted a final image that resonates in the body as much as the mind. I wanted a poem that shimmered with intellect like T. S. Eliot regurgitating The Upanishads, its edges limned with a the ghost of Robert Frost holding a delicate pane of ice over a swollen stream in March. That kind of poem. All that suffocating desire. So I stopped writing poetry and wrote an e-mail to my school asking them not to offer employee discounts to SeaWorld. I wrote and rewrote the e-mail. I added things and took things away. I wondered what magical syntax or brutally economical description would be enough to make Recreation Connection re-think the idea of a killer whale living in a cracked aquarium. I started off cheerily! Happy New Year! Thanks for adding Whale Watching to the list of Employee Discounted Activities! Sure beats watching the aforementioned animals perform tricks in a chlorinated pool! I didn’t use so many maniacal exclamations, but I did make an attempt at friendliness (Hello, I am not insane and soon you will warm to my politics). I wonder about all the writing we do. All the many non-poems, non-public pieces that we nevertheless compose with compassion and conviction. I think of the journals occupying the shelf on my closet. I think of burning each one, records of my life made long before “journaling” became a verb. Keats had the best epitaph: Here lies one whose name was writ in water. His epitaph is better than any line of poetry I will probably ever write. A name writ in water is then inscribed in stone. Moss fills the letters. E-mails vanish into the ether. The blog posts accumulate behind burning links. If I destroy those journals, will I stop feeling the weight of accumulated unread years? I’ll wrench pages from spines and light them on fire with adolescent glee. Or maybe just toss them casually in the garbage or donate them to Goodwill and dream of some hipster finding them. But first I’ll transcribe a line or two. A few words from each entry. A record of each vanished day. Some sort of path from there to here. The other day walking around the Hollywood Reservoir, I discovered a tree covered in Christmas decorations. Two trees actually. “Festooned” with decorations might be pushing it, since this is January and as glittery it appeared, a tinge of belatedness vibrated at the edges. Large silver bells, flat stencil-style presents and glittery disco-style bulbs that are either silver or green and garland gold and ribsy. Everything shone in that I-don’t-recognize-the-meaning-of-January Los Angeles sun. As I paused at the tree, some weird cocktail of juvenile delinquency and middle-aged nostalgia intoxicated me and I thought about stealing one of the silver disco balls. After all, it was Christmas and surely this tree had been decorated for a lark anyway and stealing was probably built into the design of a publicly decorated Christmas tree. But almost as soon as this impulse surfaced, like a good ex-Catholic, I immediately drown it in a tidal wave of shame and self-loathing. PLEASE DO NOT STEAL OUR ORNAMENTS. EACH ONE REPRESENTS SOMEONE WHO CAN NO LONGER WALK WITH US. I’ve been trying to develop a more sophisticated version of God than “hypercritical eyeball that reads your every thought,” but this sign wasn’t helping. As a kid, I read our Christmas tree like some annual, familiar, but always slightly altered text. The ornaments had specific histories, and their placement in the branches varied, and so the story they retold each year created slightly altered tones and new narrative possibilities. Only the nativity scene with its jagged broken donkey ear assumed the same position—perched on two barely developed branches near the trunk in the dark center of the tree. I always knew where it was, and yet my eye always came upon it as the surprised or lost child in a fable encounters a house in a primeval clearing. The story I usually concocted had something to do with the proximity and juxtaposition of the holy and the kitschy–the baby Jesus bathed in the red and green light of the lights. On that outskirts of that sacred hollow, a Snoopy with antlers instead of beagle ears skated on an invisible pond. 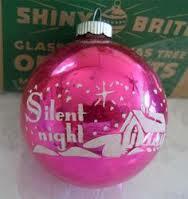 We had had a tarnished silver disco ball on our Christmas trees in the 1970s, but my favorite ornament was the glass red Silent Night bulb with its white church steeple and its simple wave of snow. It reminded me of the words of another hymn—“The First Noel” and its cold winter’s night “that was so deep.” The line stuck with me long after midnight mass because I could sense eternity in it. That a night could be deep made me reconsider darkness itself as it settled over our house and across our fields. That sort of deep rolled like a storm cloud. It unfurled like a passage, wide and silent. I suppose light has its own depth. The cardboard sign, somewhere between a plea and a warning framed itself in needles of light that jumped off the haphazard garland. It reflected me back at myself like the disco ball ornament I’d considered stealing. If I was living a myth (and who says I’m not? ), my theft of the ornament would end in a haunting, my guilt fractured into a thousand spirit fragments in the miniature mirrors of the disco ball that I’d hung it blithely on my rearview mirror. Distracted by its mocking, spinning death whirl, I might drive my car into a ditch and no one would know I’d died of a heart attack brought on my ghosts before internal injuries. This is the season of the naked and the abandoned. The fallen. Christmas trees haunt the alleys. I find the sight of these briefly coveted messengers of joy quite depressing. A tree if it is to be sacrificed, surely deserves to be an object of contemplation longer than the Christmas season or at least recycled to return in some fertilizing capacity to the earth. Passing these desolate trees on sidewalks, I feel their silent reproach. It’s as if I’m in church all over again: I died for you. There is something that sees hidden deep in those branches, something stolen from the pagan forest dragged inside and draped with new religion, then stripped again and forgotten. I like to imagine the tree on the edge of the Hollywood Reservoir still decorated in May or June, surprising those running or walking along the sandy shoulder of the road, the silver bells in the silent dry light of summer, the ragged breath of garland, the words lodged in its living branches. For the second year in a row, I spent New Year’s Eve at a Buddhist mediation center with friends. This is a tradition that I never really consciously initiated, but one that I highly recommend. It is nice to enter a new year in the silence of meditation or following the rhythmic drone of prayer in a softly lit room while people are lighting fireworks or firing guns or generally acting like madmen in the dark outside. 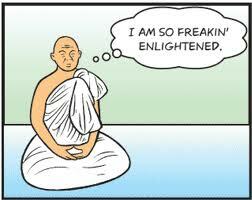 The monk was funny. After talking about resolutions (regular flossing, fitness) and the power of the mind, he recommended a meditation that appealed to me: “I may die today.” “Or,” he said, looking out at the hundred or so people filling the tiny hall, “it’s likely that some of you might die this year. Not everyone will make it back here next New Year’s Eve.” This focus on death is designed to help us remember what’s important, which in Buddhism is resolving to become a better person and through this discovering some sort of peace which we can share with others. Later Connie, Gail and talked about the countdown to my descent in the shark cage in South Africa in June. I made jokes about dying in the shark cage, because to joke about death is to at once acknowledge it and ward it off. It would be too perfect, too absurd for me to be eaten by a white shark when the whole point is to live to tell about it, to describe what it’s like to meet this old friend, this old fear, this dream human face to conical snout.What do their eyes look like, really? What’s the exact nature of their blackness, or up close are they really pure black at all? Sometimes I think that more difficult even than death itself (which promises, at least in my view, a degree of contentment, which brings with it the fulfillment of work that here remained unfinished, which is a state of perspective and unity), is the fourth remembrance. Inescapable change, the separation from people and places, things that I am sometimes fooled into believing are permanent simply because they endure for twenty or forty years. Maybe later I will decide that the infirmity and indignity of old age is tougher, or that facing death whether it comes in the form of a shark, or dark, rapidly dividing cells, defies my attempts to tame it with philosophy. I don’t know. But I do know that in a world in which everything dissolves and departs, we have to have some ballast, be it a prayer or tradition or the habit of matching every day with a number to make life feel at last, real to us.